Okay, “NBA 2K,” you’ve dominated the basketball gaming scene for far too long. The “NBA Live” franchise released a trailer Saturday for its newest game, “NBA Live 18.” And in viewing the trailer, NBA Live appears to be attempting a serious comeback. The game will be on PlayStation 4 and Xbox One, and a free demo will be released in August. For the first time in a while, gamers will have to give serious thought as to which basketball game they want. It’s about time the basketball gaming community has some competition. After 2008, Live gradually fell off – and 2K only went up. Live produced games in 2009 and 2010, but didn’t come out with a game from 2011-2013. Since then, Live has produced games from 2014-2016; the franchise didn’t produce a game for 2017. While 2K began its rise in 2011, Live struggled to compete. A factor in 2K’s rise was the franchise implementing NBA legends. Michael Jordan graced the cover of NBA 2K11, setting a precedent for future basketball games. The game boasted a “Jordan Challenge” mode in which players could perform in some of Jordan’s brightest moments. Before, no other basketball game let gamers play with legends such as Jordan, Julius “Dr. J” Erving or Magic Johnson. It was the prevalence of the legends that was different. Gamers could pit Jordan and other legends against current NBA players. On top of legends entering the game, 2K spawned My Career, a mode in which gamers could create a player and rise through the ranks of the NBA. Despite not being as good in recent years, the career mode was perhaps the game’s best one from 2011-2015. In addition to the interactive My Career mode, 2K’s graphics have only improved with time. The graphics and presentation are nearly lifelike. Compared to 2K, Live’s graphics have been a joke in past years. Culturally, 2K has taken over too. No longer are most gamers talking about balling out on Live. They’re talking about doing well on My Career. 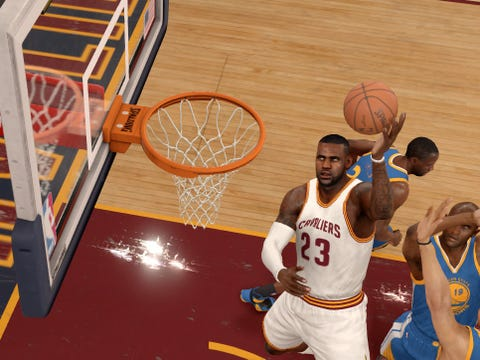 So as 2K rose, it had everything – and Live had nothing. But now, Live has something. And it’s called “The One,” a game mode that looks like it could challenge My Career. The streets feature is a reason for Live’s intrigue this year. While the game’s graphics and presentation have improved – the first step to competing with 2K – Live has created a similar feature that looks better than one 2K already has: My Park. Introduced in NBA 2K14 as “The Park”, My Park has always had potential. But the streets feature on “The One” has a chance to take that away. In the streets side of “The One,” gamers can take their players to legendary parks such as Rucker Park in New York or Venice Beach in California. They can play 5-on-5, and the mode will reportedly have co-op and multiplayer options. In addition to being able to play at famous parks, gamers can also engage in a pro-am experience at The Drew League, which is based on the real-life pro-am league in Los Angeles. NBA Live 18 doesn’t have an official release date yet. But with the demo coming out in August, the basketball gaming community might have to reconsider buying NBA 2K18. Because a former gaming giant appears to be rising again.